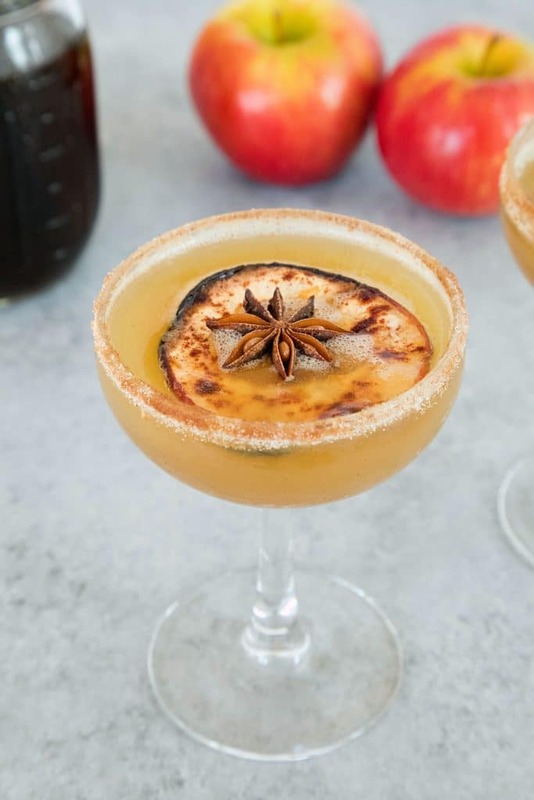 Honeycrisp apples combine with a holiday spiced simple syrup and bourbon for the perfect holiday apple cocktail. Don’t forget the cinnamon sugar rim! Oh man, I have a serious case of jet lag. But I promise I’m not complaining because I just spent a glorious 12 days in Hawaii and I have zero right to complain about anything right now. My vacation involved sun and food and pools and beaches and cocktails and books and hikes and adventure. Basically, all you could want in life. And now I’m home and this week is Thanksgiving and I have NO idea how that happened since I’ve been off gallivanting in the sun with no indication that the holidays are here. But they’re here!! In an effort to force myself into the holiday spirit as efficiently as possible, I’m cranking up the Christmas music and getting my holiday cooking and baking on this week. Also, doing ridiculous amounts of laundry. And snuggling with my dog (I missed her a ridiculous amount!). And trying desperately to stay awake all day so I can go to bed at a normal time and get back in the Mainland East Coast timezone. Probably the last thing I need is a cocktail since I had about a million of them on vacation and having one right now would put me to sleep in an instant. But even if I’m not sipping on this Holiday Spiced Honeycrisp Apple Cocktail, I do know that having this holiday spiced simple syrup simmering away on my stove will make my house smell deliciously like the holidays and will have me in the spirit in an instant. And hopefully by Thursday, I’ll be ready for another drink or two because these would be the absolute perfect Thanksgiving cocktail! 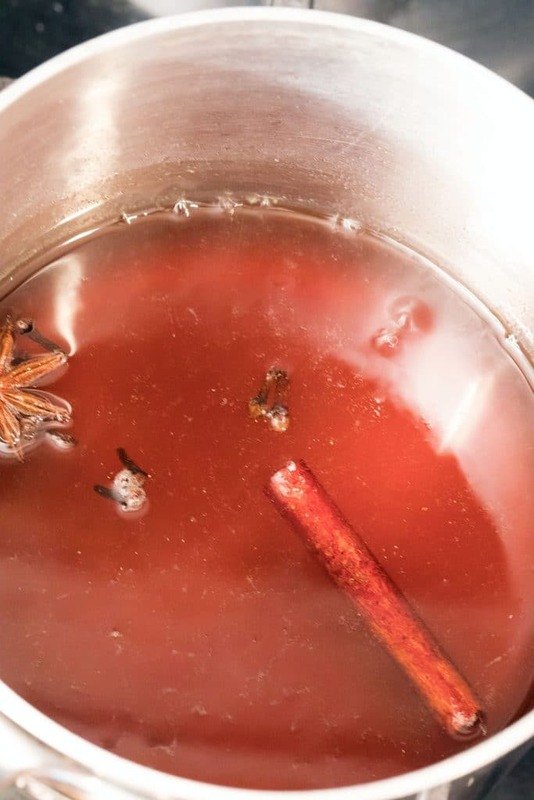 This holiday spiced simple syrup is my everything. If you’re not an alcohol drinker (or are just in need of a detox, like me), you can certainly add this syrup to soda water. I think it would be awesome swirled into oatmeal or yogurt, too! Garnish your cocktails however you choose, but I especially recommend cinnamon apple chips and star anise. If you are making your own apple chips with a mandoline, I recommend being extremely careful since apples can be a little awkward. Yes, I’m speaking from experience and no, you don’t want to hear any more details about this. Just trust me. You can also use any type of glass you have on hand, but I think this apple cocktail is best served in a coup glass; these are the glasses (affiliate link) I have if you’re looking for some good budget-friendly ones. This is a cocktail I’ll certainly be sipping all holiday season long. When it comes to bourbon cocktails, I only need one to be happy. If bourbon isn’t for you (it’s not everyone’s favorite! ), this apple cocktail would also be delicious made with vodka. 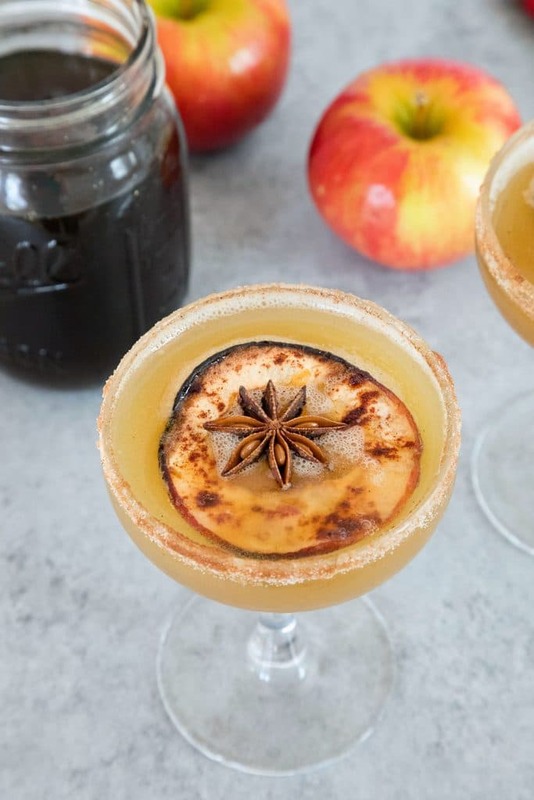 There’s certainly nothing complicated about this apple cocktail, though you can make it sound all kinds of fancy by bragging that you made your own apple juice/puree (literally apples and water in a blender) and slaved over a spiced simple syrup. If you serve it on Thanksgiving, your guests will be seriously impressed that you had the time to pull it together. 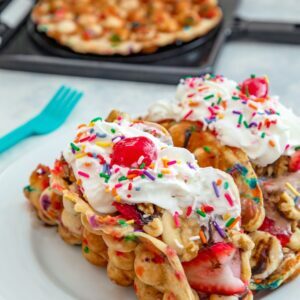 But really, you can make the puree and syrup in advance and just have everything ready to go for your guests’ arrivals. The first time I made these, I used the apple puree right away and it was fine mixed into the drink, but the second time, I chilled it overnight and it really thickened up, making the drink too thick. So, I recommend running the mixture through a fine mesh sieve after pureeing it. It may also be affected by how juicy your apples are! 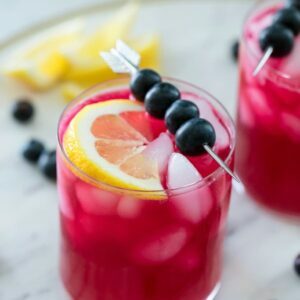 Don’t worry, I’m still obsessed with making my own cranberry juice and will be continuing to do so right up until winter is over! Wait, we didn’t even talk about the glory that is honeycrisp apples. Are they not the most delicious apples in the universe? I’m a longtime macintosh lover, but have been buying more honeycrisp apples this fall. Of course, if you can’t find honecrisp apples (boo! 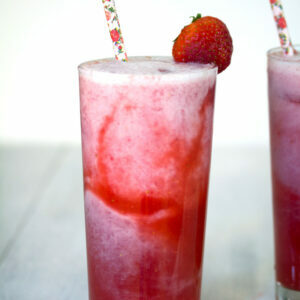 ), you can really use any type for this cocktail. On second thought, perhaps I need one of these this evening, so I can fall asleep at 11:00 p.m. instead of laying in bed feeling like it’s 6:00 p.m. (and wondering why it’s so freaking cold) and can power through my crazy to-do list the rest of the week. I can’t wait to share my Hawaii adventures with you and will be sharing a post on the Big Island and a post on Maui in the coming weeks. But for now, I really need to get my head off the islands and into New England during the holidays. Here we go. Are you feeling the holiday spirit yet? 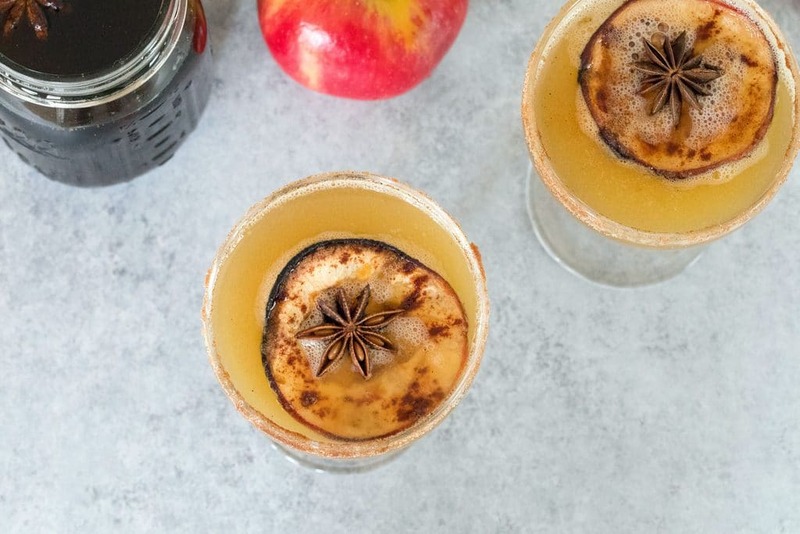 Honeycrisp apples combine with a holiday spiced simple syrup and bourbon for the perfect holiday apple cocktail. Don't forget the cinnamon sugar rim! Put honeycrisp apple slices and water in a blender and blend until smooth for homemade apple puree. Push puree mixture through a fine mesh sieve into a bowl or mason jar to get out as much juice as possible, leaving solids behind. 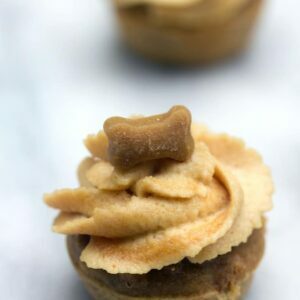 On a small plate, combine granulated sugar and cinnamon. Brush rims of cocktail glasses (coup glasses work well) lightly with holiday spiced simple syrup and twirl the glasses in the sugar/cinnamon mixture to coat rims. Pour 2 oz. homemade apple puree, 1 1/2 oz. bourbon, and 1/2 oz. holiday spiced simple syrup into each cocktail glass. 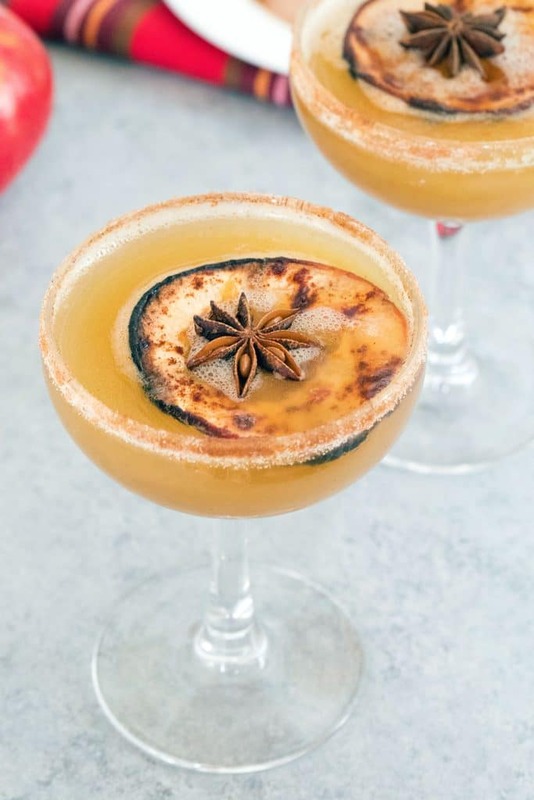 Garnish each cocktail with apple chips and star anise, if desired. Combine all ingredients into a small saucepan over high heat. Bring to a boil. Lower heat and let simmer for about 10 minutes, until sugar is completely dissolved and syrup thickens. 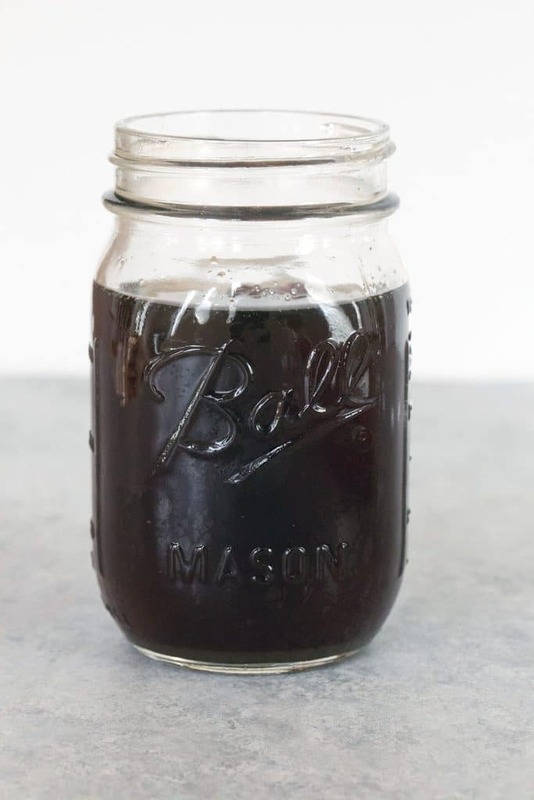 Strain syrup into a jar or bowl to let cool completely. Store simple syrup in refrigerator. Leave cinnamon sticks and anise in the mixture, if desired, to continue to develop the flavor. 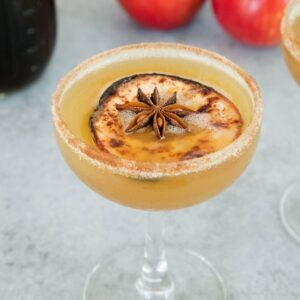 9 Responses to "Holiday Spiced Honeycrisp Apple Cocktail"
Very pretty and bourbon is my spirit of choice! Plus so jealous you got to spend 12 days in Hawaii. Sounds wonderful! The perfect holiday cocktail – and so pretty! My taste buds jumped up even when I just read the title. This sounds so refreshing and festive. Thank you! This looks delicious and what a nice touch with the star anise. Love this! What a freakin’ gorgeous cocktail, Sues! It looks so festive and all those flavours are delicious! It is 5 yet 😉 ?? what a cocktail and this is perfect for best holiday, it looks amazing, i can’t wait making this drink. Thanks for sharing….! wow..! this is a fantastic drink for any holiday. 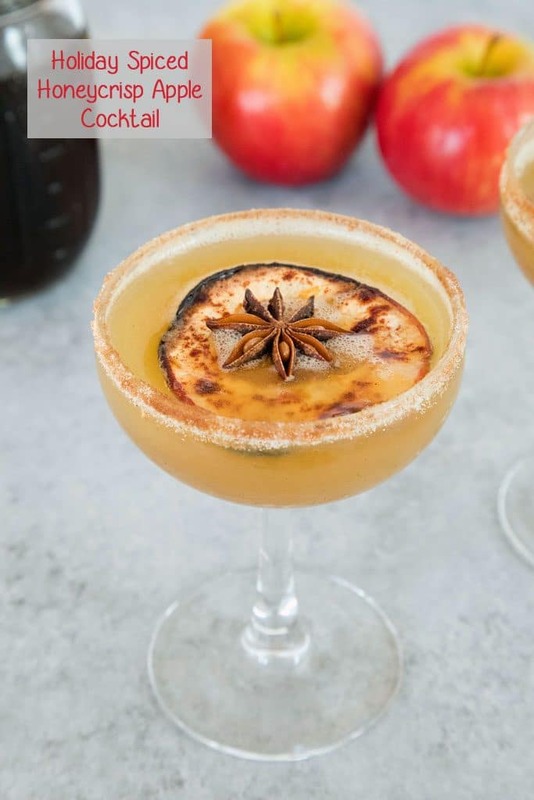 and its looks amazing, i will trying to making this apple cocktail. Thanks for sharing…. !